I once had this very rare LucasArts' game. I bought it many years ago at eBay if I remember correctly but unfortunately I don't have this anymore. Post some comments of this very cool release. I would love to know if there are more collectors who have this cool Dig edition and some other thoughts too. Have you read the novel and how did you like it? This is rare, but not nearly as rare as the Full Throttle bandana. There is two known sealed copies of FT bandana + 5 or 6 open copies. Dig with novell is not so rare as open box, you can see it few times per year on Ebay. But your copy is the only sealed one I have seen. I have couple of these, but I would not rank it as the rarest USA release. They're still quite rare and desirable though. These were some of the later releases, presumably contained the books to try and boost the sales. Hard to say how many were sold... guess it depends on how successful the promotion was. In my opinion, the rarest USA release would be "The survival kit". It had a complete copy of the game and a whole lot of other goodies in an outer box. After that the "Phone card" release, that had a phone card you could use to call the hint line. But after that release I would place the "Free novel" edition, but placing the shiny box version above the standard one. I'm not going into depth about the other releases here, they all deserve their own thread. I've never read the novel, I really need to get around doing it some day and see how it compares to the game itself. Yes! I'm doing a hapy dance. I scored this incredibly cool box for only 19.99 euros. I didn't know this version had a gatefold cover. It's awesome! Unfortunately it wasn't complete. I'm missing about everything except game and game brochure. Somebody know if there also is a strategy guide included? It indicates it on the box. I'm trying to find out what I have to piece together to make it complete. It's a beauty... think it was my first version of "the Dig". Now I know what I'm looking for. Good luck, the hard part's over. You've got a good conditioned box. The content can be cobbled together from various USA releases since this copy didn't contain any items that were just included with this specific release (I.E. the novel was also sold separately). 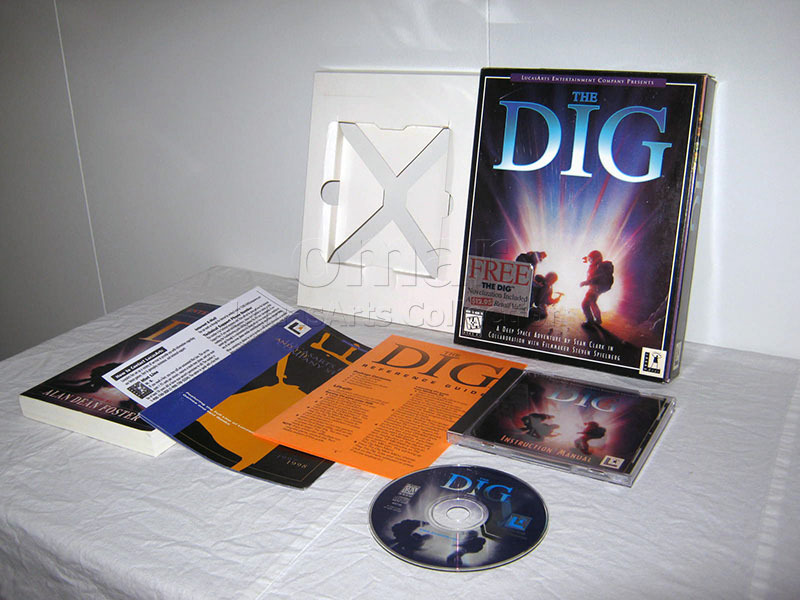 I have another copy of The Dig. I might use that to fill up this baby. But f.e. I have a white ref guide and not an orange...that's a bummer. Another Novel Edition popped up to ebay today, but the box is in pretty rough shape.